My daughter’s Elf on the Shelf has returned, and although finding new and creative places for her to appear can be exhausting (hell, remembering to move the damn thing can be a real challenge—which is why my husband, thankfully, took on the job), I love seeing the excitement and wonder that Christmas brings to her. A friend of mine asked me the other day if Nola still believed in Santa (she’s 8). I’m happy to report that yes, she does. And even though someday she’ll discover that Christina is just a doll that Bubba moves around and Mommy is the one that buys Santa’s gifts to her, I hope she always will believe. Because I still believe in Santa. I believe a world in which Santa exists is just a better world to live in. I believe in Christmas magic. And I’ll tell that to my daughter when she starts to uncover the deception we parents employ to create that magic for our children. We need more magic and light in the world. Kristine Grayson believes in Santa, too. At least, I’m pretty sure she does. 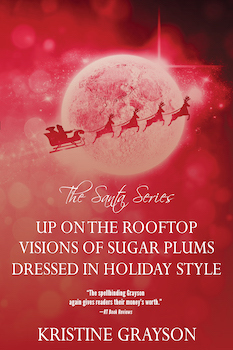 And her Santa Series is the perfect way to recapture a bit of that Christmas magic. The boxed set is available for $5.99 in ebook here. And don’t forget that if you’re still in the market for Christmas gifts, the WMG December Holiday Spectacular includes two surprise gift boxes: one for writers and one for the whole family. Each is valued at more than $250 but is an amazing holiday deal for $50. You can find out more and place an order here.